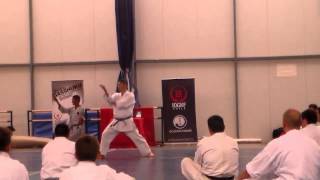 Videos of all Goju-yu Kata up until 3rd Dan level. These videos are for reference and motivational purposes only. The only way to truly learn the Kata in its correct form is from a fully qualified IOGKF instructor such as those in the IOGKF. 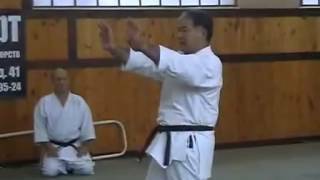 ​Performed by: Sensei Morio Higaonna ​Created by Chojun Miyagi Sensei in 1940 for introduction into the school system and to help make the average person stronger. Literally translated as 'to destory' it is a power Kata designed to help you combine and create power and speed for your punches, kicks, blocks and moving. Performed by: Sensei Morio Higaonna Created at the same time of Gekisai dai Ichi it also translates as 'to destroy' part 2. This Kata introduces and develops Tora guchi (tiger mouth block) and Neko ashi dachi (Cat stance) which is a common feature of higher level Kata. It also introduces open hand techniques. This Kata has since been refined to feature the Kiai point on the reverse punches. 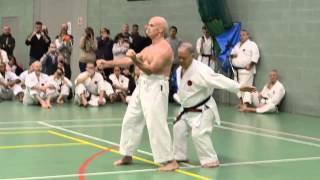 Performed by: Sensei Morio Higaonna ​Saifa Kata translates to 'smash and break' or 'pound and pulverise'. Its characteristics of heavy back first and circular swinging movements give meaning to its name. It is a short Kata, but one with numerous sequences that require precise timing to execute correctly. Performed by: Sensei Tetsuji Nakamura Seiyunchin means to 'grasp and unbalance'. along with its signature low Shiko dachi stances, Seiyunchin Kata features a lot of Hazushi Waza (escaping techniques) with most attacks being from wrist grabs or behind. Performed by: Sensei Tetsuji Nakamura Shisochin means to 'attack in four directions' or 'four directional fight'. There is no Shiko Dachi in this Kata as in the previous one, but it requires a lot of co-ordination between the hips, arms and legs to perform it correctly. In his later years, this was Chojun Sensei's favorite Kata. 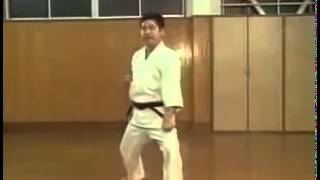 Performed by: Sensei Tetsuji Nakamura Sanseru means '36 hands or movements' it requires lots of explosive and speedy movements and introduces Kansetsu Geri (joint kick) to the Goju-ryu Kata system. It features defences against multiple attacks. Performed by: Sensei Tetsuji Nakamura Seipai translates as '18 hands or movements'. Like Seiyinchin a majority of the movements and defences are from grabs and holds, requiring fast escaping techniques. A lot of balance and co-ordination between the hips and body is required to perform this Kata correctly. 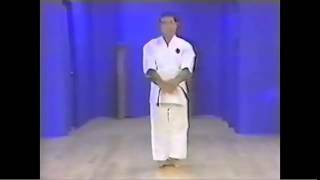 Kata by: Sensei Ernie Molyneux Shime by: Sensei Morio Higaonna ​Sanchin is the breathing and bedrock Kata of the Goju-ryu system. Using the Tanden Kokyu breathing method co-ordinated with movements of the hands. Shime 'slapping test' is for black belts and only after years of practice and building up. 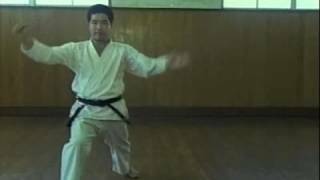 Performed by: Sensei Morio Higaonna Tensho means 'Rotating palms'. Chojun Miyagi Sensei saw a Kata called Rokkishu on one of his trips to China and added this to our system under the name of Tensho. It once again requires co-ordination between the movements and breathing.